So, have you checked out our newly released Coat of Arms Creator? Visit our Download page and grab it now. Then you should read our little instruction article sitting atop of Features area. After all that, do you think you have an great looking design? Make a screenshot of your design and link it here (using "Advanced HTML Format" and choosing "Image" from it's menu) and post your own back story! the community discord server, as long as your entries are posted on the #coa-contest channel (direct link to the channel). 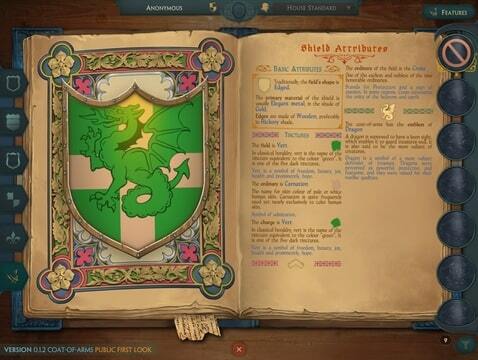 You can simply paste your coat of arms screenshots right from your clipboard and add your backstory next to it. If we get enough entries we want to award prizes in three categories: Best COA Design (judged by Sándor), "most creative use of heraldic meanings" back story (judged by Mat) and best writing of the back story (judged by Mark). If we get too few entries, we will pick a single winner (a consensus winner chosen by Sándor, Mat and Mark). Prizes! Since we like to give you options, let's say you're playing for A) your COA - meaning you can keep it even if we eventually lock down some of its elements for achievements or purchase; OR B) a Steam game license of a cult Indie title (we have several to choose from). Only one prize per player (even if you submitted more than one entry). Your choice! The contest will run until the end of July. Plenty of time to develop and create your unique coat of arms! Players may enter the contest with up to three (3) different designs and back stories. Entries must entered via a link and post here, through our Twitter or Facebook sites, or through our community Discord server. Designs entered without back stories are allowed. Original link: Check the Original. This is my recreation of the Coat of Arms of Jollan de Neville. Jollan de Neville was born the younger son of Jollan de Neville in Rolleston in Nottinghamshire in 1187, decendant of Nevilles who were companions of William the Conquerer in 1066. The name Neville (with all its variant spellings) comes from a town in Normandy where the family originated either "Neuville" in Calvados or "Neville" in Seine-Maritime both meaning "neu(f)" new, "ville", a settlement. The family motto is (typically for heraldry of the time) a pun "Ne vile velis" translates as "Wish nothing base"
These characteristics are borne out by the familys martial history and their key role in negotiation and political manouvering to attain and maintain peace. The addition of the rose to the coat of arms for Jollan de Neville is typical as a stylized form consisting of five symmetrical lobes, five barbs, and a circular seed. The rose in heraldry, often used as a charge or badge, has had many meanings in this case most likely refers to Jollans status as a younger son of the family. Jollans mother was Amflicia de Rodliston. A Nottinghamshire manor (a feudum if you will) which she brought as dowry, was subsequently passed, through the hands of her elder son John to Jollan. Jollan possessed this feudum in the reign of Henry III after his elder brother John, who served for some time in Gascony, died in 1219. Jollan was justice in eyre in Yorkshire and Northumberland variously between 1234 and 1241 and also superior justice, sitting at Westminster from 1241 until 1245. Despite his legal standing he was also in trouble at least once in his life being pardoned for some unknown offence against the king. Jollan de Neville died in 1246 in Yorkshire, at which point his twenty-two year old son also called Jollan succeeded to his lands. Jollan de Neville, an intelligent and educated man, was the author of 'Testa de Nevill,' an account of fees, serjeanties, widows and heiresses, and churches in the gift, of the king, escheats, and the sums paid for scutage and aid by each tenant. While this work deals with a period previous to 1250 one entry refers back as far as 1198, for which Jollan de Neville is unlikely to have been responsible. It is therefore very possible that the 'Testa de Nevill' was the work of more than one author. Jollan de Neville's father also called Jollan, who was, moreover, connected with the exchequer probably compiled the early entries. A portion of a copy made during the fourteenth century is still held in the Record Office. The Neville family arrived in Britain in 1066 with Gilbert de Nevil, the companion in arms of William the Conqueror and also the Dukes Admiral as part of the Norman Conquest. The Nevilles remained a powerful family during the Wars of the Roses in the 15th century; Richard of Neville 16th Earl of Warwick carrying the name 'The Kingmaker' Richard was given this name due to his large part in putting Edward IV on the throne in 1461 and then deposing him in 1470 and then ... you get the picture ... Richard at his last was stuck from his horse and killed attempting to flee the field of battle at Barnet in 1471 following confusion in the literal fog of war as his own army attacked itself due to the poor visibility on the field. This returning Edward to the throne. Kingmaker is my favorite board game with many good memories of a childhood evening planning strategies - the precursor to my interest in the genre of games that Feudums is part of. I still play occassionally. In Kingmaker Neville is one of the key families to control. This together with my families connection with Bosworth (where the War of the Roses ended dramatically in 1485) gave me the inspiration to recreate this particular coat of arms. The inclusion of the rose charge in the center of the Neville coat of arms that is specific to Jollan de Neville (although not consistently used through his life) is obviously unconnected with the war of the roses (in which the rose emblems were only used widely in the final battle at Bosworth) as he died ~200 years before the war started but in the romantic part of my mind appears prophetic. Thraxas, a technical note as I saw you're trying to make it work: as far as I know, Google has recently retired the feature to embed pictures from google drive (as web resources). It is affecting most of our old indiedb articles too. Still, your screenshot is perfectly visible through clicking on the link, so other than not being able to show a thumbnail of it, it's all good. I'm happily putting it to your post later today if you wish so. Alternatively, if you visit our discord server and paste your screenshot there in the appropriate channel, we will update your post with it (same applies to everyone with the same problem). That would be great - I was just enhancing the detail in the backstory when I saw your kind reply pop up :). Edit: Thanks it looks great! This is a contest entry that has been posted by Vasile on discord Today at 5:54 PM. This is a contest entry that has been posted by scont on discord Today at 12:42 AM. Contest entry that has been posted by Prodigy on discord Today at 5:46 PM. 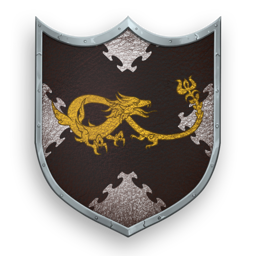 I already have a story that I made really fast, like I did with this Coat of Arms, but my brother laugh of my imagination. I wanted the CoA to look different, with a big gate under the stone walls. Why would your brother laugh? Why would your brother laugh? I really like the coat of arms as it is and the idea of a gate within walls - it gives a fantastic image of strength and fortitude. ... perhaps your brother suffers from glass house syndrome? This is just a reminder that we're almost out of time. Everyone who wishes to enter the game - or polish his current entry with a background (Scont & Prodigy?) - please do so as soon as you can, as we're going to close the application period on the coming afternoon. This is the house of Bert Starker. Bert grew up as the third oldest son of "insert kingdom name"s King. His royal blood is represented by the purpure tincture on his coat of arms. When he was 17 years old a plague swept his country and his two older brothers died. Now being the heir to the throne he fell victim to his only remaining siblings envy, his sister. Backed by powerful nobles inside the kingdom and promising local autonomy his sister enacted a plot to frame him as an illegitimate child of the king leaving her as the only heir. Banned from succession and unsure of his heritage he is forced into exile in a neighboring kingdom. This is represented by the per bend sinister ordinary. In exile he quickly gains the favor of multiple foreign forces all trying to influence the succession of "insert kingdom name". When he turnes 21 his father dies and his sister ascends to the throne. Using unrest caused be the succession Bert rises up as a pretender to the throne, plunging the country into civil war. Admired by many Bert is a charismatic leader and eloquent speaker represented by the carnation charge. He always looks ahead and never gives in. He sometimes tends to be arrogant and stubborn. This makes him great at convincing people to support his cause but terrible at compromising with those who don't. Ever since his sisters betrayal he has problems trusting the people around him, alianating many possible friends and leaving him with mostly pragmatic relationships. The green tincture in his coat of arms represents his hope and struggle to recover the throne which was rightfully his someday. The sun on the other hand represends his self centered nature, but also his ambition to bring happiness to his people as their rightful king. Last but not least the embattled lines represent fire, a destructive force that will strike any who do not share his vision. The scratches on his shield prove that while he prefers to lead his army as a tactician he is not afraid to raise morale by leading the charge. This is what makes the CoA generator so great. Creating stories like this in your head just by picking parts for a CoA. I hope I can communicate some of the fun to be had when playing around with the CoA generator as a creative storytelling tool. This basically writes the story for you :D Do tell me what you think, Id be happy about any kind of feed back, here or on Discord. Pretty much last minute but I'm glad you made it. :) Too bad we couldn't see Prodigy's story too - but he can post it anytime later, just not for the contest. A quick statistics, provided by Unity Analytics: there has been about ~120 unique users trying the latest version of the CoA Creator out so far. I just wish we could have seen more of their CoAs posted here or on discord. Well, maybe next time. Thank you for the brave men who entered the contest! Hear ye! Hear ye! By order of the King, the winner of the Coat of Arms Creation Contest is... SCONT. THRAXAS finished a strong second. We liked Scont's entry for several reasons - He entered with an entire concept (back story & design), started from nothing and built his story as he built his coat of arms, and used the coat of arm's elements as a muse to bring his background to life. On the artistic side, his CoA had an interesting mix of elements (earning Sándor's choice for most interesting CoA). Thraxas, on the other hand, put a lot of effort in telling the story of Jollan de Neville, a historical person with a real CoA. What we liked about his is its a great example of recreating real life with our CoA Creator... plus it cleverly showcases how a family CoA and a person's CoA in the family can be slightly different (using a historical example)! Which is what we are trying to recreate with in-game Noble House coat of arms and the specific game avatar CoAs. some in-game Golden Forints. Just let us know. some in-game Golden Forints. Please let us know. @Scont : Very well done! A worthy winner, I was also very impressed with your entry, lots of detail & gave a good background to the CoA. For my second place, thank you, I think I'd quite like to use my CoA in game if thats ok. Thank you for your kind words Thraxas. Yours was pretty good as well. I love the amount of detail you have put into recreating this historical CoA. As my reward, like Thraxas, I would like to use my CoA ingame. King Anthonet of the Tsin kingdom is the last thirty-two-year-old son of the Lupine family. Family Lupine - mother Lulu and father Frances - was killed in a dream by traitors who disappeared. Now Anthonet, King of Tsin, who will restore the prosperity of the kingdom, will continue his adventure, which will be described in the Diary of his exploits. Who knows, maybe Anthonet will be able to overcome his fears: not to die in a dream, how his parents died, to conquer The Dragon of Darkness in himself, will be able to ride the Natural Dragon of Good, that on his coat of arms, and become the Almighty of the World, and everyone will worship him. And can he restore peace on the Earth? It all depends on the king himself - either he will retain his throne, or the power will pass into the hands of his enemies. Thanks for trying out the CoA Creator! My good King Anthonet! Greetings from land of Texas! While you missed the deadline we had on the contest, I do appreciate your post. Did you like the experience of using the CoA Creator? Was it easy? Hard? We're trying to gauge player interaction with the tool and would appreciate any comments you would be willing to share. Thanks again and welcome to the Feudums family! We'll have more stuff coming soon so stay tuned!